The Holyoke Merry-Go-Round carousel is comprised of 48 magnificent horses hand carved by the Philadelphia Toboggan Company: 16 standers on the outside row that are stationary, 14 jumpers in the middle row, 18 standers and jumpers in the inner row and 2 chariots. The Merry-Go-Round features 56 original scenic panels, 864 brightly colored lights and 98 beveled mirrors. The Holyoke Merry-Go-Round is located in Holyoke Heritage State Park, the site on which Holyoke Heritage State Park is located was once used by the William Skinner Silk Mill. Holyoke Heritage State Park was planned after the mill burned down. Today, the Holyoke Heritage State Park boasts landscaped grounds for picnicking and views of the canals and mill buildings between Dwight and Appleton streets in historic downtown Holyoke. 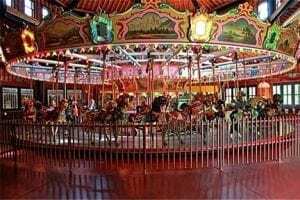 Take a spin on the Holyoke Merry-Go-Round, situated in the southwest portion of Holyoke Heritage State Park, also home to the Children’s Museum of Holyoke and Volleyball Hall of Fame. Holyoke Heritage State Park Visitors Center tells of the history of industry in Holyoke, focusing on how industries were built and flourished and were forced to adapt and eventually close.The Visitor Center is open Tuesday through Sunday from noon to 4:30. Admission is free. 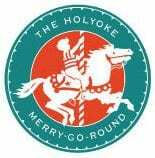 The Holyoke Merry-Go-Round, Carousel Club!